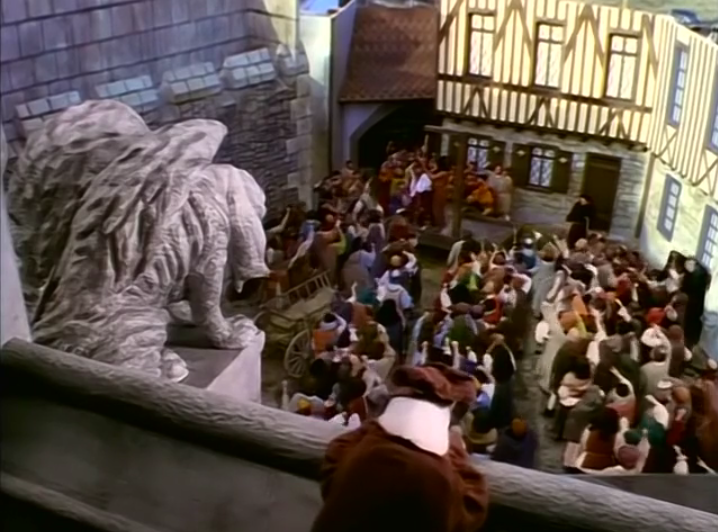 The production values is where the Wishbone version of Hunchback fails. 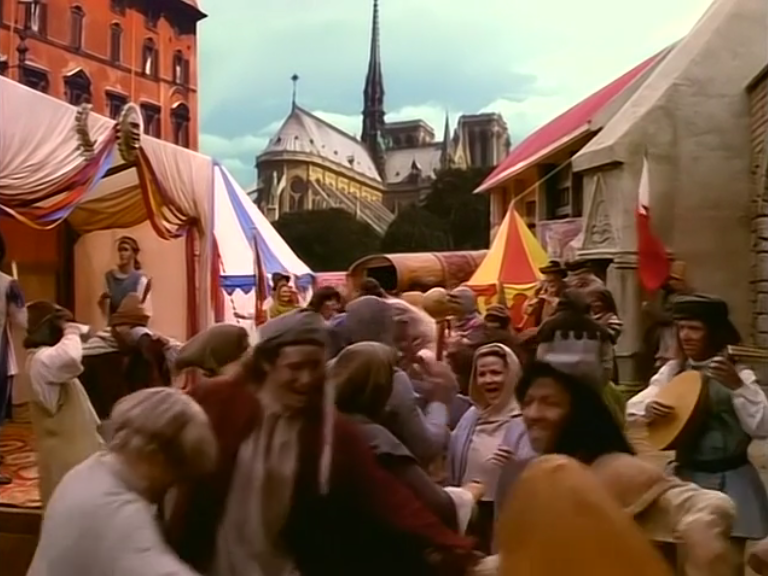 I have seen more conniving ren-faires. Though it being a PBS show I’m not going to completely bash it because it doesn’t have the same budget as a movie or regular Tv show. One the biggest problems is the composite shots with Notre Dame in the background. The shot they used of Notre Dame has a very strong green and blue tone whereas the production uses a lot of warm tons. The contrast is jarring and it takes the viewer out of the story because it looks overly fake. The sets look very much like sets. The don’t have much age or personality but you seldom notice the sets to begin with. Really the nicest you can say about the sets is they’re dull. I mean you can just tell that the stone is painted. 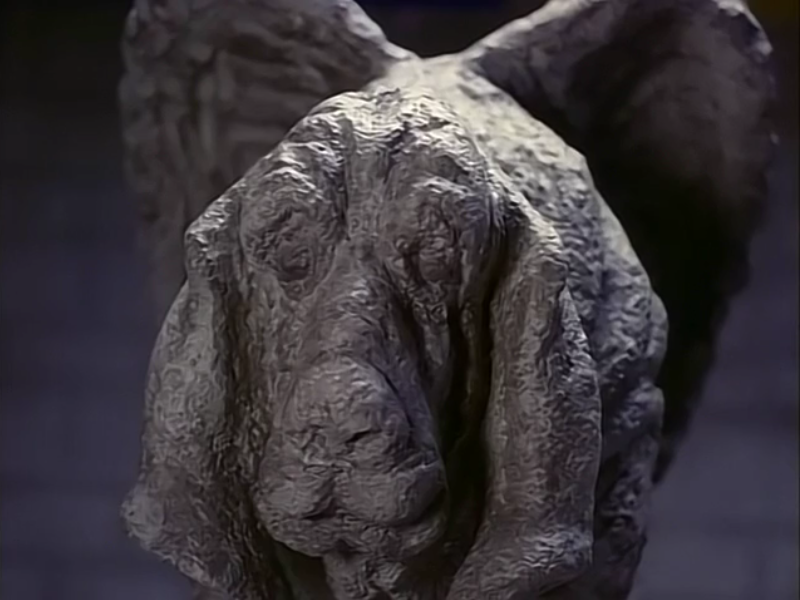 However the dog gargoyle while it does not look like stone at all is is at least cute and clever. 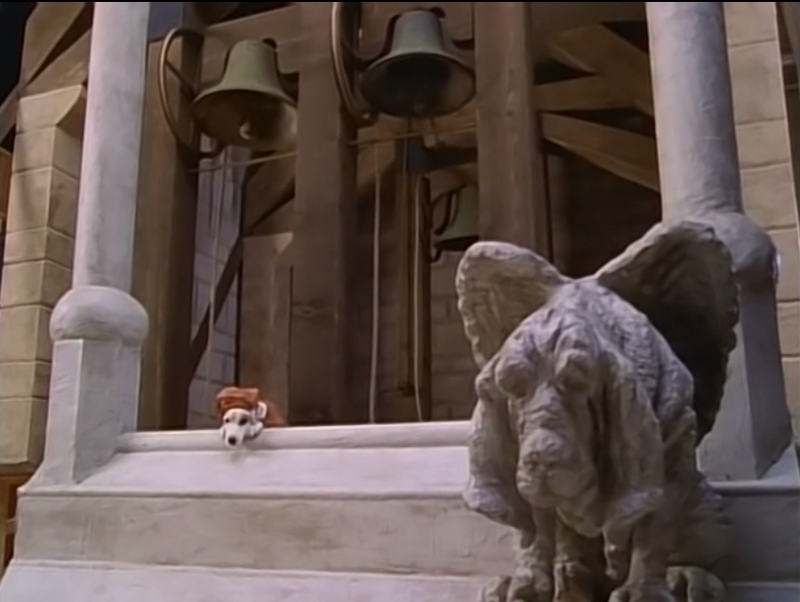 The only costume I think were made for this production was Wishbone’s Quasimodo costumes. 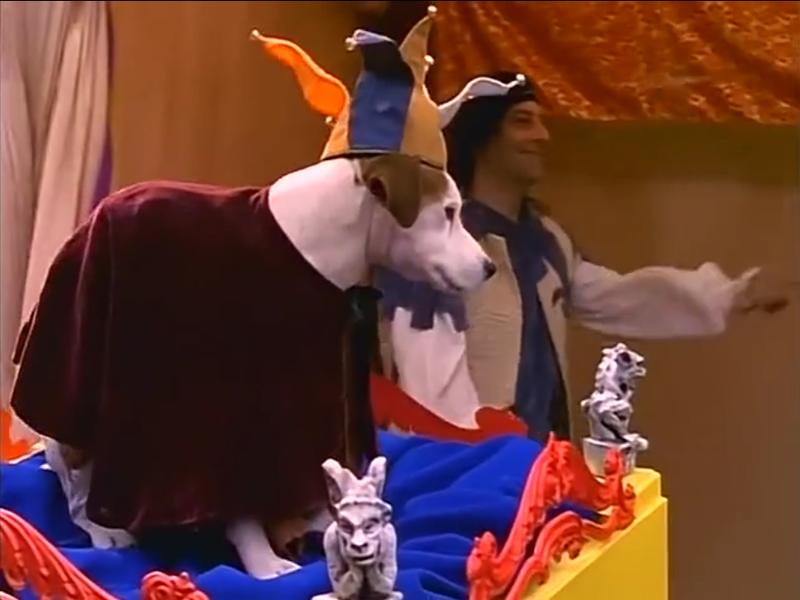 A hunchback dog costume in 1995 seem to have been made custom but all the other costume just look like theater costumes. They are not interesting but they are serve their purpose. 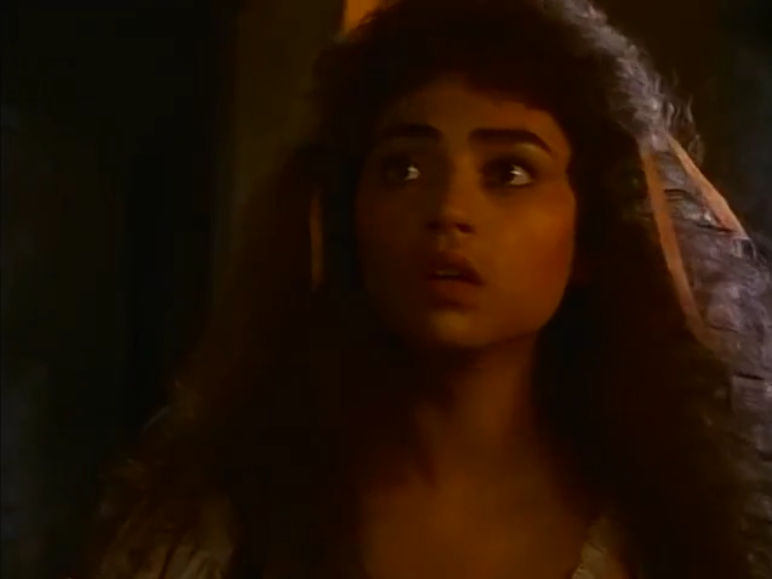 I will say I’m happy Esmeralda is not in bright red but what is up with her hair? Is that Lanell Pena’s natural hair or is it a wig? I found it very distracting especially since Lanell Pena is very pretty. One of the major strength in this version is the camera work. The use of the camera make this interesting and diminishes impact the fake looking sets. I really like the shot of the crowd parting to reveal Esmeralda. There are just a lot of good interesting angles. For the part the production values on this version are really weak however the acting is not bad. 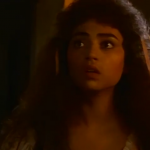 Although Esmeralda is generally my fave character, this adaptation of the character kind of reminds me of a poodle. The ribbons just look like random stuff that got stuck in her hair.